Surprisingly, other statistics provided by the ADA, show that only about a third of children actually wear a mouthguard when playing sport.² This is not to say that two thirds of parents are not concerned enough for their child’s safety to purchase a mouthguard. The fact is, that often they buy a retail product that turns out to be ill fitting and uncomfortable and the child will not wear it! Dental Prosthetist, Diane Tozer, from Brisbane, highlights that a ‘boil and bite’ mouthguards are no substitute for custom-made ones – for two main reasons. Even if the off-the-shelf product is cheaper than buying one made for your child, it is still a waste of good money if he or she leaves it in their kit bag because it is uncomfortable to wear. Parents want the best protection for their child but may be unaware of the limitations in terms of the protection afforded by retail ‘boil and bite’ products. At her practice, Westside Denture, in Brisbane, it is an unfortunate fact that, as in EDs and Dental surgeries across Australia, she sees patients who have lost teeth during sport because they were not wearing a mouthguard. She supplies many dentures Brisbane, as a result, and says that she would far rather have been called upon to supply a custom mouthguard in the first instance as many of the injuries she sees, could probably have been prevented if the patient had been wearing one. 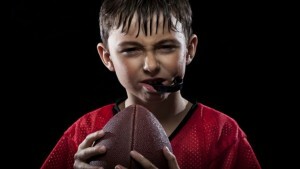 Why Choose A Custom Mouthguard For Your Child? Although any mouthguard is better than none (if worn 100% of the time, during sporting activity), the custom made type not only provides the best protection but also, the highest levels of compliance among young wearers. While, quite often, the uncomfortable, off-the-shelf type gets left in a sports bag or locker, a custom fitted sports mouthguard is much more likely to end up where it is supposed to be – in the mouth! They fit better, are more comfortable, kids are not worried that their mouthguard is going to move in their mouth, or drop out – and best of all, like them because they can speak clearly and breathe comfortably. They can have the practical feature of name and contact number added in case they get misplaced. Children seem to like the range of colours available, which range from fluorescent to team or school colours. It is great to think that something that keeps them safe is also appealing as this encourages compliance. Why Risk Your Child’s Smile? Remember a mouthguard is unlikely to be worn if it is uncomfortable. Custom mouthguards really do provide superior levels of protection to teeth, jaws, tongue, gums and lips. The prospect of lost teeth and dental surgery is not a good one. Many injuries are preventable simply by wearing a mouthguard; Mark Brirghitti, goalkeeper for Newcastle Jets football team will certainly wish he had been wearing one when an on-pitch incident resulted in 40 stitches and several lost teeth! So make sure your child has 60 times the protection, give Westside Dentures Brisbane a call today on 07 3278 0580.